Ever since year one, we have believed in celebrating Sweetpea’s Diaversary. To me, it’s a great opportunity to celebrate her for being tough and strong and putting up with all the crap that diabetes throws our way. It’s a day to celebrate LIFE. I also think it’s a great way to help make diabetes – or at least PARTS of diabetes – a little fun. I don’t want her to think of it as all doom and gloom and yuck and ouch. I’d like her to look at is as something that is often not so great… but has it’s good points, too! Basically, I’m adding to the silver lining any way I can! The first year we had a big party! 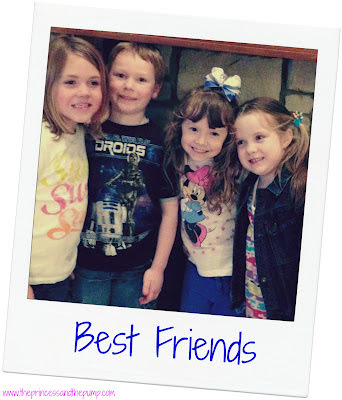 We invited a bunch of her friends and went to a local place that is a lot like Chuck E Cheese. The kids had a blast and it was a great memory! The second year we had made plans to go with some friends to a bounce house place and have cupcakes and play. That didn’t happen as we were in the hospital that day. Boo! This year we decided that J and I would take the day off and we just do fun things! We went out to breakfast with my parents. We went to see the movie Chimpanzee. And then we partied! We had a little party at our house. 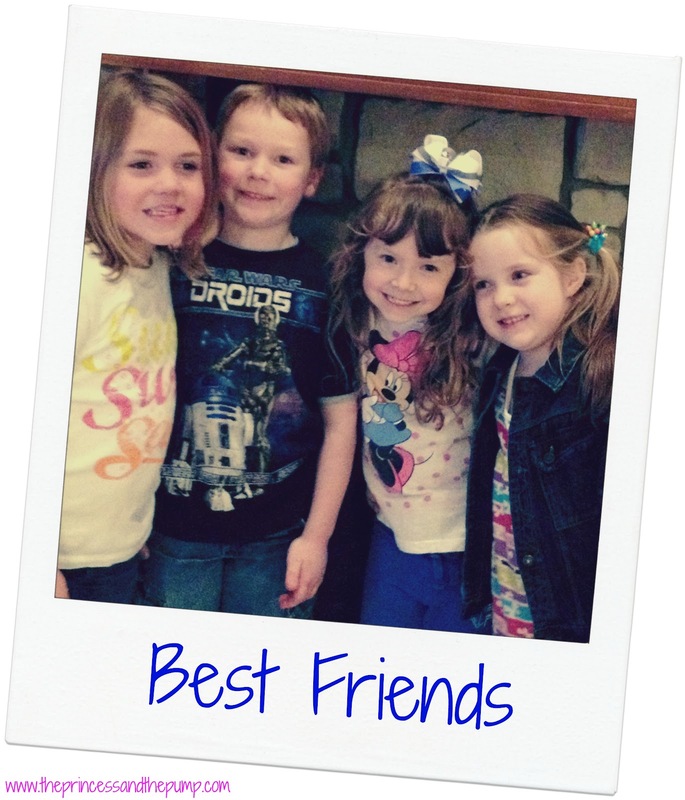 We invited Sweetpea’s closest friends over to just play and hang out and eat cake! Cake is an integral part of our celebrating! Sweets loves cake (she gets it honest!). And I love that it’s also a fun way to snub our noses at D.
Of course, I also go to do a little educating this year when I told the girl at our favorite cake place what we wanted on the cake! 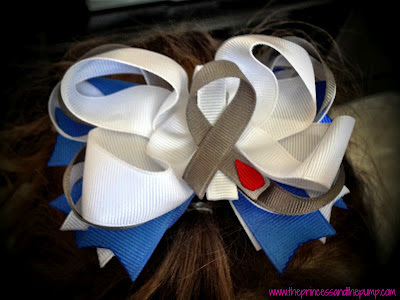 This is the bow she wore... If you haven't guessed - we LOVE our hairbows! What a great way to advocate! And look stylish doing it!! “It’s MY DAY” she kept saying. As if every day isn’t really her day…. But whatever! It made her feel special. And she deserved it! Celebrating a dx day is not for everyone. And that’s ok! But for us… it works. It’s a silver lining – coated in buttercream frosting! So tell me… What do YOU do on your dx day??? 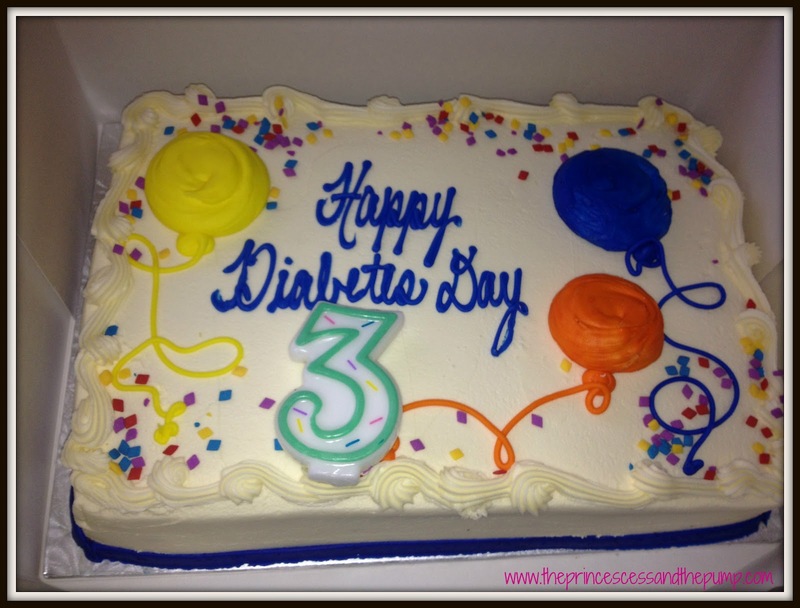 Click HERE to read the post about our FIRST Diaversary and HERE to read about our second Diaversary. What a great celebration - I think we need to celebrate the fact that our kids and us make it through this every day! She is so precious. Happy 3rd year - you rock! I always got a soft serve ice cream cone. It was kind of an inside joke because the day before my diagnosis (in DKA coma), my mom thought I needed some sugar bc I hadn't eaten anything in days, so I had ice cream. She always felt awful about that decision (as if the ice cream were some sort of catalyst - ridiculous, I know), so we made light of it by using it to celebrate. It IS your day, Sweets. Go, you! We call it our graduation, we have 3 years experience living with D. We also make it a special day and go out to dinner as a family. This is such an awesome idea! I love how you're putting a positive spin on having diabetes. She's sounds like such a sweet girl! Happy belated diaversary! I'm obviously very behind on my blog reading...but know that I remembered your #3 was close behind as we celebrated #3 here too!! Glad that it was a yummy celebration this year! I love the cake and I love the ice cream!